Janet Sheed Roberts was the granddaughter of William Grant - founder of Glenfiddich distillery. Scotland's oldest woman has died peacefully at her Moray home aged 110. Janet Sheed Roberts was the granddaughter of William Grant, founder of the Glenfiddich distillery. She died at her Dufftown home on Friday, April 6. Mrs Roberts celebrated her 110th birthday in August last year. Peter Gordon, Glenfiddich chairman and Mrs Roberts' great-nephew, said: "We have lost an incredible woman. My great-aunt's contributions to the business and support for the family members who did so much to make the company the success it is today were immeasurable. "She lived a remarkable life and witnessed great change at the Glenfiddich distillery over the past 110 years, and she will be sadly missed by all of us." 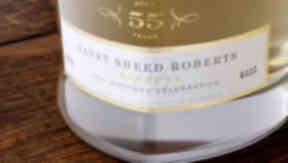 The Glenfiddich distillery has been raising money for charity with a special single malt in Mrs Roberts' name. Only 11 bottles of the Glenfiddich Janet Sheed Roberts are being released to the public. Each bottle of the single malt Scotch celebrates a decade of her life. The third bottle broke records by selling for £47,000 at auction in New York last month. Known by her family as Wee Janie, Mrs Roberts studied at both Glasgow and Edinburgh universities. While studying law in Edinburgh, where she was the only woman in her class, she played hockey for the first team. Mrs Roberts met future husband Eric while working for law firm McGrigor Donald. They married in 1938 at Glasgow University Memorial Chapel. Her husband later became a director of William Grant and Sons and she travelled the world with him, promoting the business. The funeral will be held at Mortlach Parish Church in Dufftown on Wednesday, April 18, followed by an interment at Cabrach Churchyard.